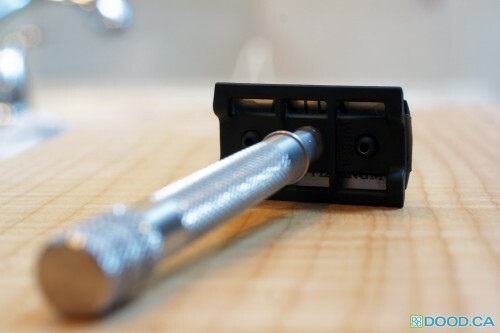 The Weber Razor was the first of the Stainless Razors to hit the market, and entered at a very affordable pricepoint at the time, around $55. Since then its increased in price to $70. Interestingly, at the time the Weber was released, many gawked at the price, saying $55 for Stainless Steel with little to no performance increase was not worth the money. Now a couple years later, many people happily pay well over $100 or even $150 for many of the other boutique stainless razor brands – including myself. I tried to capture the spirit of the razor, but realized that DE Safety razors are inherently difficult to photograph. This configuration is with the classic handle, which is slimmer and longer and also slightly heavier by 2 oz. As you may be able to see I had it loaded with an Astra SP blade at the time of the photograph. I have a lot of bulldog handles that I am able to switch onto the Weber if I want a shorter, stouter feel. Here is the razor from the front, showing the proportion of the handle to the razor head. Definately a slimmer look compared to the more popular Bulldog style that has been all the rage the last year or two. The handle has the typical curved neck, and then cross-hatched middle section, along with the knobby textured end which aids in retention and grips very well in most conditions. 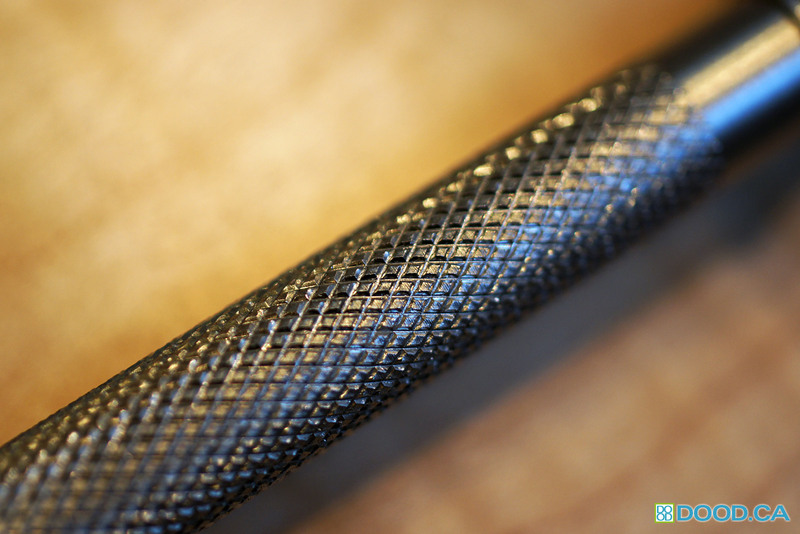 As you can see below, the texture of the 316 Marine Grade Stainless Steel handle under higher magnification, is not finished particularly well. Its certainly acceptable, especially when all of the other better finished handles cost more money. Weber currently sells the handles for $38, whereas most others come in around $50+. The handle measures 98mm long. I was able to get a decent photo of the blade gap here, and you can see that it is similar to most non-stainless razors and in particular very close to the Merkur 34c and Edwin Jagger 89l that I have used. The head shape in general seems to have been loosely modeled after the Merkur in particular. 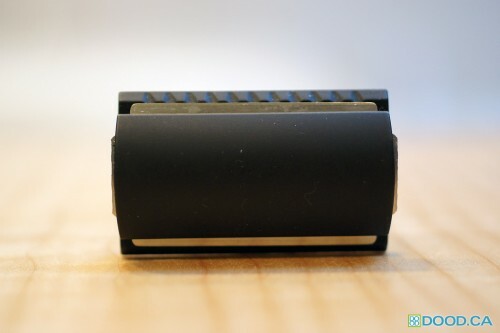 I found the aggression level of the razor to be on par with the Edwin Jagger and Merkur razors mentioned, and in general is a mild-to-medium level shaver, but you can adjust that level by changing your angle. Here’s a shot from the front, showing the amount of blade exposure. 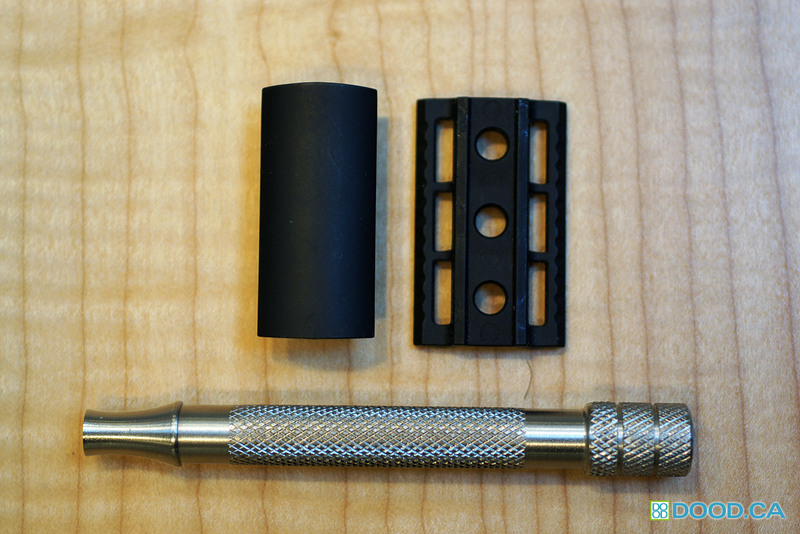 It has more blade exposure than most of the newer style Stainless Razors which minimize blade exposure and blade gap. I find that the smaller blade gap and exposure reduces the change of cuts and razors burn from incorrect angle… essentially making the razors more “fool-proof”. While I rarely cut myself shaving anymore, I still like there is less leeway with the Weber than with the other stainless razors on the market. The Weber gives good audible feedback, which aids in making sure I have the right angle when I am shaving. 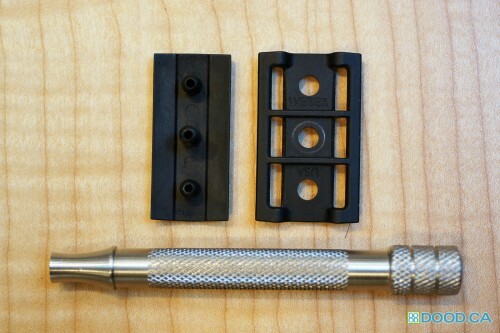 There is a disassembled shot, showing the inside of the razor. The head comes in several version, this being the black DLC one, and also one of the more sought after versions of the Weber head. Its also available in a special ARC finish as well as standard polished. 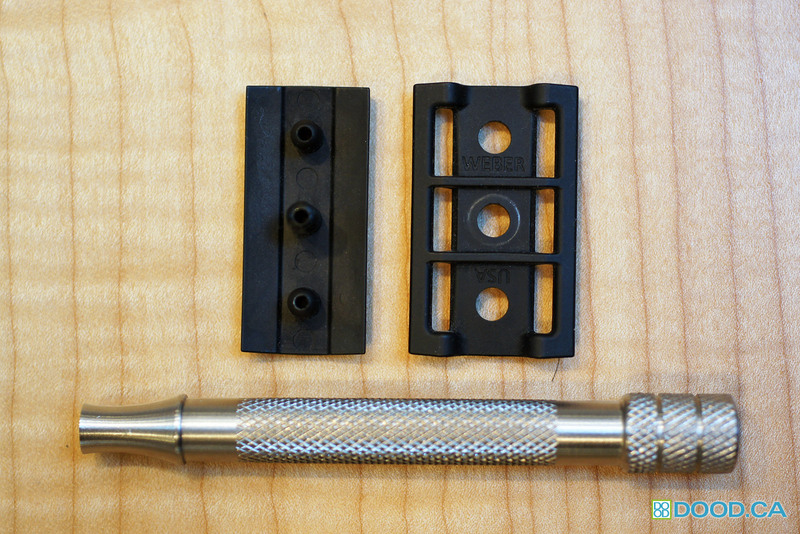 All versions of the razor head are made from 17-4PH Stainless Steel. The back of the Razor head is engraved with the words WEBER and USA. 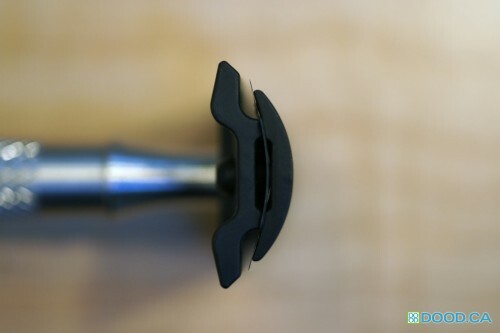 The Black DLC coated version of this razor always has black rubbing off at the base where the handle contacts the head. Being OCD, this bugs me a bit but I understand that it is the nature of the beast. 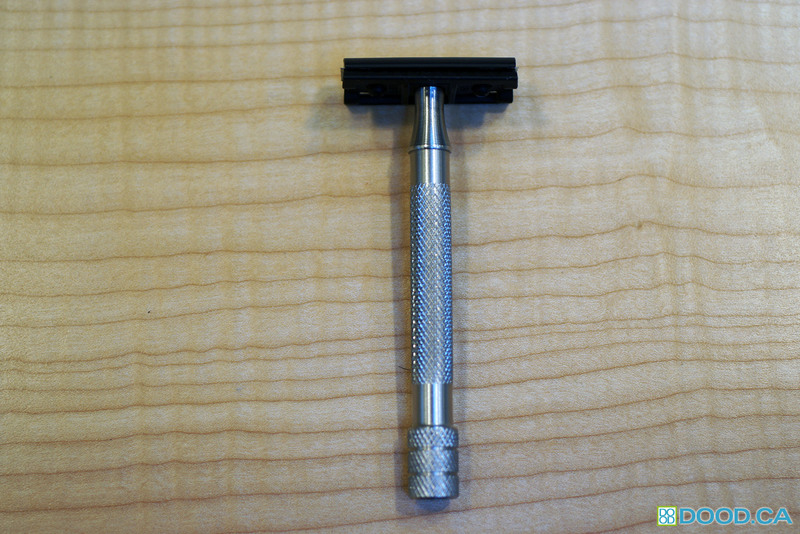 Overall this is a very nice razor, and a very good value for $70. However, there is a substantial improvement in finishing level and overall production quality when moving to other stainless steel razors like the Feather, iKon and ATT razors. This entry was posted on Tuesday, April 1st, 2014 at 11:14 am	and is filed under DE Safety Razors. You can follow any responses to this entry through the RSS 2.0 feed. You can leave a response, or trackback from your own site.